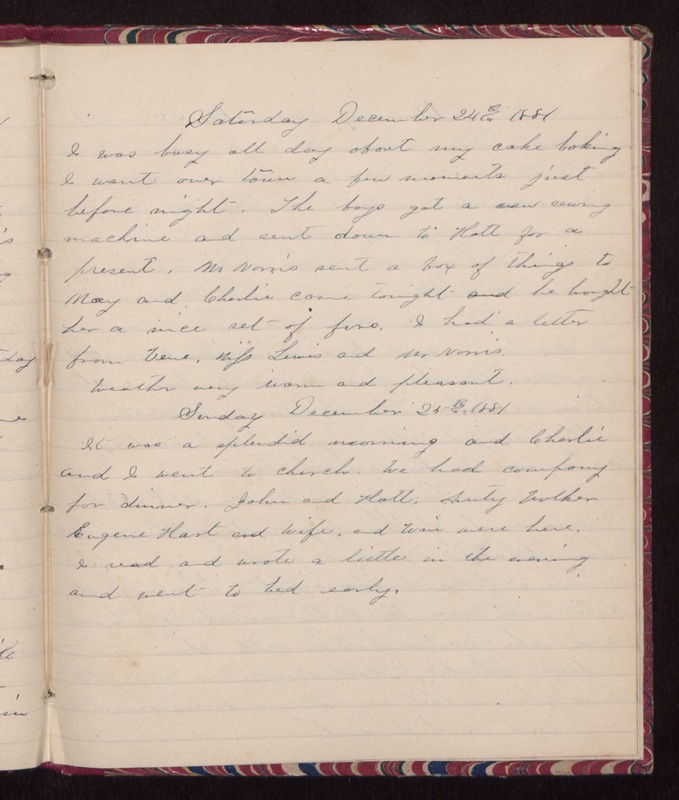 Saturday December 24th 1881 I was busy all day about my cake baking. I went over town a few moments just before night. The boys got a new sewing machine and sent down to Hatt for a present. Mr Norris sent a box of things to May and Charlie came tonight and he bought her a nice set of furs. I had a letter from Vene, Miss Lewis and Mr Norris. weather very warm and pleasant. Sunday December 25th 1881 It was a splendid morning and Charlie and I went to church. We had company for dinner. John and Hatt, Aunt Walker, Eugene Hart and wife, and Win were here. I read and wrote a little in the evening and went to bed early.